FxCop -- Framework Cop, checks code violations against some rule. You can write your own custom rule to enforce some rule in development area. For instance Checking Namespace naming convention or checking SPDisposeCheck etc. In this post I am going to show how we can easily integrate FxCop with Visual Studio 2010 so that you can check violation while you build your project. There are two ways to achieve this goal. 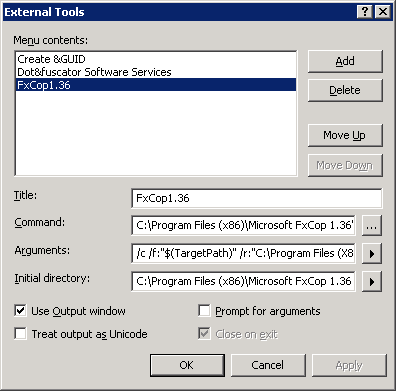 or you can run FxCop.exe UI tool to check violations in your assembly. 2.Add you desired rule assembly in "C:\Program Files (X86)\Microsoft FxCop 1.36\Rules" folder or you can specify your assembly folder via /rule:"Path to your folder"
4. If you want to run FxCop in multiple .dlls you can specify multiple switch like /file:"Path to your .dll file" /file:"Path to another dll" or /file:"Path to a folder where mutliple dll resides"
In next post I will be explaining how we can integrate FxCop with build pipeline.